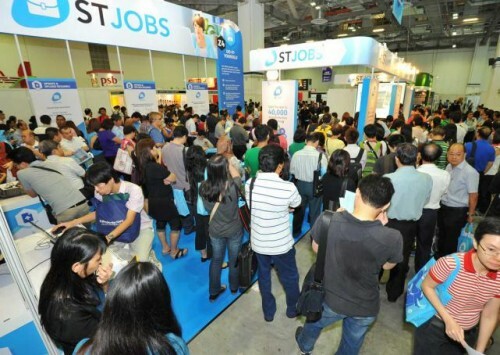 SINGAPORE - Job seekers can gain professional career advice and meet potential employers at the STJobs Career & Development Fair 2016 from July 2-3, 10am - 6pm, at Marina Bay Sands Hall D & E.
The fair, held for the fifth consecutive year, hosts more than 100 booths spanning various industries offering recruitment or training opportunities and programmes to visitors, including AIA, Great Eastern, Grab, Marina Bay Sands and SBS Transit. It will also feature five zones with a suite of free activities specially designed to prepare job seekers in meeting potential employers and building up their careers. Job seekers can visit a resume and visume (video resume) clinic for one-on-one professional consultations to improve their CVs, or draft a one-minute pitch which they can use to record a visume. Attendees can also sign up for a professional career consultation session with career coaches from e2i (Employment and Employability Institute) to help with career-forward planning, making for a wholesome job hunting experience. The July edition of the U Future Leaders Summit 2016, jointly organised by NTUC and SPH, will also be held in conjunction with the fair with the theme "Future-Ready Careers amid Global Transformation". Minister in the Prime Minister's Office and NTUC Secretary-General, Chan Chun Sing, will also be holding a closed dialogue session with participants. Attendees of STJobs career fair can also look forward to hearing from key industry thought leaders as they share about future market trends that will help job seekers and working professionals prepare for what lies ahead. The summit is open to Singaporeans and permanent residents only. Members of the public can register for the two-day summit for $100 while NTUC members can register for $60. Singaporeans and PRs may attend the fair on both days while foreigners with valid work passes or student passes from local institutions are invited for admission on July 3 only. Admission to the fair is free. For more information, visit http://careerfair.stjobs.sg/fair2016/.